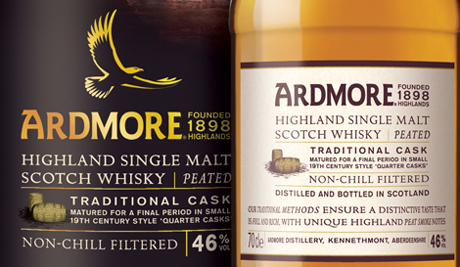 Our long time favourite in the ‘Amazing Price to Quality Ratio’ category – Ardmore Traditional Cask – has at last been officially tried and reviewed by EWB. What a joy! Nose: Peat smoke jumps out, followed by cloves, grist and summer fruit. Distinct caramel overtones. Wet wooden floor, damp cellar. Palate: Smoky again, spicy and oily. Very firm. Sweet liquorice. Extremely satisfying undiluted! Finish: Early on delivers medicinal tones but quickly transforms into malty, bready heaven. Overall: Smoky superstar from the mainland, an absolute essential in your cupboard. Unreal value. This entry was posted	on Monday, October 18th, 2010 at 9:02 am	and is filed under Reviews. You can follow any responses to this entry through the RSS 2.0 feed. Responses are currently closed, but you can trackback from your own site.